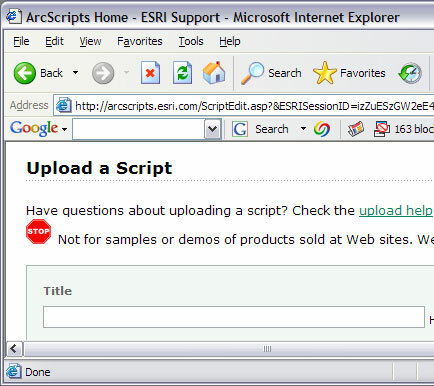 I’ve been critical of companies uploading commercial products into ArcScripts, but now they are uploading the same file more than once. Sure they use the excuse of German vs. English to give them reason to upload the file twice, but we all know they shouldn’t be doing it anyway and it says that you can’t upload demo software to the site so I can only conclude they did this for commercial reasons. I mean, why pay for an ad on a website or GIS magazine when you can put it right on ESRI’s site. And a trip to their website, you quickly see that their site runs so slow. Moving the downloads to ESRI’s servers should help with the speed. Why pay for your own bandwidth when ESRI can host the file for you? The first screen when you upload your file you see the following. Even if you are color blind, I assume these companies can read. The only conclusion is they are marketing their products using a service from ESRI, that has a goal of allowing GIS professionals to freely share programs and scripts they have created so that others can benefit. No wonder most of us don’t like using it anymore.